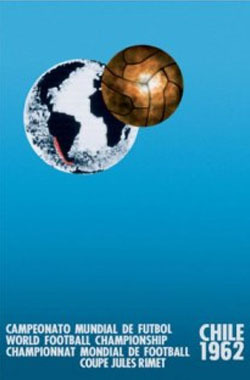 The seventh World Cup was played in Chile from May 30 to June 17. The qualifications that had started two years earlier included 57 national teams. Of these, 14 teams manage to go on to the final tournament together with the automatically qualified host nation Chile and reigning champions Brazil. Chile was an unexpected choice as the host for the seventh World Cup. Argentina had seemed more likely since it was South Americas turn, but due to political instability in Argentina at this time Chile was instead nominated. Despite that African and Asian nations would participate in the qualification round, only American and European nations would partake in the final tournament. The African and Asian teams had to play extra qualification matches against European teams that decreased their chances. No African nation would reach the final tournament until 1970 when FIFA finally gave Confederation of African Football one guaranteed place. The rule that dictated a replay after a draw was abandoned and goal difference was used if two teams would have the same amount of points in the groups. The goal difference gave advantage to teams with less conceded goals which contributed to defensive tactics. The matches of the World Cup in 1962 was taking place in three different cities and stadiums. 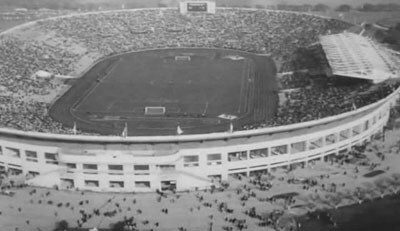 It was prearranged to be eight stadiums, but a megathrust earthquake in Valdiva (south of Santiago), with magnitude about 9.5 affected the plans. Besides the national stadium in Santiago the remaining three stadiums were very small being World Cup stadiums with capacities under 20,000. The opening game is about to kick off in Estadio Nacional. Despite an injured Péle Brazil managed to defend their title. They did so by beating Czechoslovakia in the final by 3-1. With Péle on the bench the big star was Garincha. Another big football name that was participating in the 1962 World Cup was Ferenc Puskás, but this time for the Spanish national team after he had changed nationality due to the Hungarian Revolution. Great footballs stars that change nationality and team was at this time quite common (but would soon be changed by new rules). Chile managed to eliminate Soviet Union, that had won the first European Championship, in the Quarter-finals and finally win the bronze medal and once again proved the traditionally advantage of being a home nation in the World Cup (except in 1962 Chile has never succeeded to go further than the first round in the knockout phase). Some games were very rough and the brutality escalated several times into fighting incidents in which boxing and kicking took place on the field. The worse scenes were displayed in the game between Chile and Italy, infamously known as "La batalla de Santiago", which has become known as one of the most scandalous matches in the World Cup history. 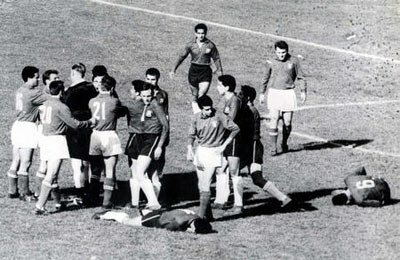 The disgraceful events culminated with a long brawl whereas one of the Italians players would finally be assisted from the field with the help of local police. One of the tumult scenes in the match between Chile and Italy. Just like the previous World Cup tournament no substitutes were allowed, which could have served as incitements to unjust play. Neither was yellow and red cards yet taken into practice – a player could however be sent off and this happened six times in the Chile tournament. FIFA World Cup 1962 would include 32 matches in which 89 goals were made. The 2,78 goals per match were by far the lowest in a World Cup tournament and reflected a new tendency in the game where tactics had become more focused on defense – some meant that many games had been boring to watch. Soviet Union, Yugoslavia, West Germany, Chile, Brazil, Czechoslovakia, Hungary and Italy would advance from the group phase. In the Quarter-finals Chile, Brazil, Yugoslavia and Czechoslovakia won their matches and was going through to the Semi-finals. Chile world face Brazil and Yugoslavia were facing Czechoslovakia. It would be Brazil and Czechoslovakia that would be contesting in the final for the FIFA World Cup trophy. By winning in 1962 Brazil defended its title and became the second nation ever to do that – Italy had been the first winning in 1934 and 1938.